October is a glorious month. One of my favorites, if not my very favorite! With her vibrant array of colors, her crisp scents of spent foliage, her warm days and stoic nights, she is a delightful autumn messenger. 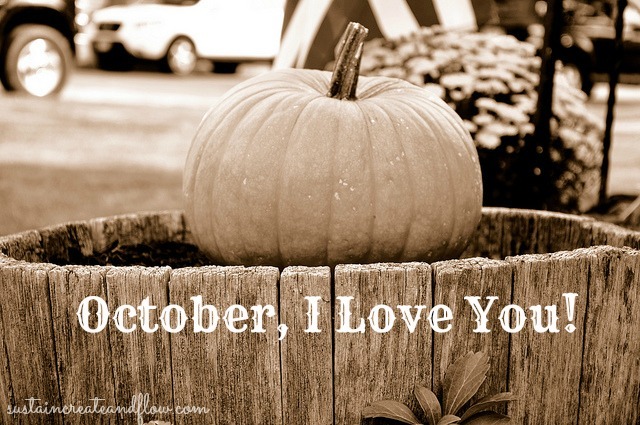 I have loved October ever since I was a little girl. And not just because October possesses one of the most beloved children’s holidays, but because of her radiant beauty and magic she beholds. October, I really love you. Now is the time for my sweet little family to create lasting memories and traditions for how we will choose to celebrate our holidays. I don’t have many family holiday traditions that aren’t commercialized or marketed, so as a mama, I get to blaze my own trail and adopt traditions that my family will love and appreciate for generations to come. I want to gently de-emphasize the candy-usurping that is Halloween. I recently read, (sorry, didn’t note the source), that childhood illnesses increase dramatically in early November. Is it the changing weather? Likely. But it would be foolhardy to ignore the fact that children’s immune systems are weakened by an over-abundance of sugar. Something doesn’t seem quite right about re-enforcing that my child beg from door to door, only to fill a basket with horribly unhealthy fake “food.” I don’t want her thinking that costumes cheaply made of exploit, and overpackaged goods are things we subscribe to. I want her to know that Autumn has so many wonderful things to celebrate! Halloween, of course, is included, but not the focal point. Work for a while on a handmade costume. Carve beautiful pumpkins from the pumpkin patch trip and roast the seeds! Attend fall and halloween themed events at libraries, churches, children’s centers, etc. Watch Hocus Pocus (Ha ha, that one was a joke; but not for me because I LOVE that movie! Yes, my friends, I’m a die-hard SJP fan). *Check out my “Healthy Halloween” Pin Board to see some examples of brilliant healthy Halloween-themed snacks! And at the end of it all, go Trick-or-Treating! What about you? What ways have you found to celebrate fall and take the emphasis off of candy? Do you have special traditions in your house for this season and for Halloween? Please share them with us! If you’d like to contine the conversation on facebook, you can find me here. I love October too! Such an incredibly beautiful time of year. This is a great list of activites! I will keep it handy over the next couple of weeks.